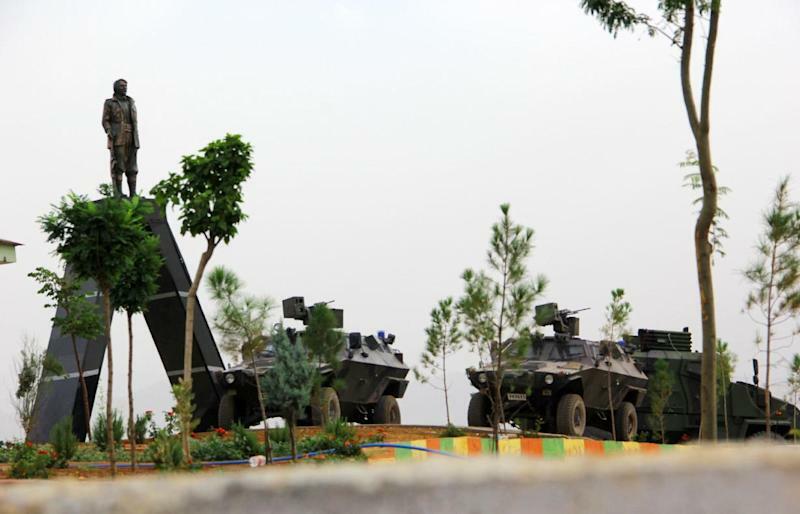 Istanbul (AFP) - Three Turkish police were killed after an ambush in Turkey's overwhelmingly Kurdish southeast, in an attack claimed Saturday by armed Kurdish militants despite a one-and-a-half-year ceasefire. The private Dogan news agency said traffic police on the highway between the southeastern cities of Diyarbakir and Bitlis were attacked with rocket-propelled grenades and rifles late Friday. Another team of police were deployed as reinforcements as the clashes continued, but their vehicle overturned in an "accident" at the scene, the agency added, without giving further details. Dogan quoted Bitlis governor Orhan Ozturk as saying that five police were taken to hospital. Three died of their wounds while the two others were receiving treatment. NTV television showed the three police being given a funeral with full honours in Bitlis, their coffins draped in the Turkish flag. There was no further information on the assailants from the authorities, with the ambush coming at a time of mounting tensions between the government and Kurdistan Workers Party (PKK) rebels. But the People's Defence Forces (HPG) -- the military wing of the PKK -- claimed on its website it had attacked the police as a warning to the Turkish government. It said its "guerilla forces had carried out the action from a close distance". It also claimed another attack outside Diyarbakir on Friday, which it said had killed one Turkish policeman. This purported incident has not been reported by Turkish media. "If the Turkish government does not abandon its murderous actions... then our answer will be clear," the HPG said. If confirmed, the attack by the HPG would be a significant breach of the ceasefire between the PKK and Turkish authorities, which has largely held since March 2013 despite stalling peace talks. Several Kurdish militant factions have warned violence could break out again if the government does not produce a convincing roadmap for the peace process by the end of the month. The PKK, which has been observing a truce in its 30-year insurgency in the southeast, is angry at Turkish policy on Syria as Islamic State (IS) militants advance on the Syrian Kurdish town of Ain al-Arab. Some 160,000 mainly Kurdish refugees have fled across the border into Turkey, but Ankara infuriated Kurdish rebels last week by not allowing some back into Syria to fight the Islamists. The ruling Islamic-rooted Justice and Development Party (AKP) has insisted it remains committed to ending Turkey's insurgency, which has claimed 40,000 lives over the last three decades. "We have reached a very valuable point in the peace process and I know its value," the CNN-Turk television channel quoted Deputy Prime Minister Yalcin Akdogan as saying Saturday. "Tearing this up or making threats is not going to get us anywhere and is just going to create problems. Let's sit down and talk," he added.